For intense insulation for your legs pull on this pair of extra long ladies Heat Holders thermal socks. In a knee high length, enjoy the extreme warmth that the 2.34 tog rated socks will provide. Made from a specially blended heavy bulk yarn these chunky Heat Holders are the ultimate in thermal socks. 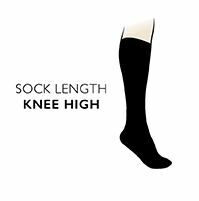 The inside of each knee high sock has been intensively brushed, giving them a sensationally soft feel, while holding more warm air close to the skin therefore keeping legs warmer for longer. The long pile cushioning, means these socks will not only help keep legs cosy but protected too.